Oily T-zone and dry cheeks? This is the story of every woman with combination skin. People with oily skin, age relatively slower and more gracefully than those with dry skin types. So woohoo! Try to look at the upside, your skin is naturally glossy, so even if you don’t dab on highlighter, you still have #thatglotho! We know it does get troublesome though, so if you want to address some of the oiliness on your skin, we recommend investing in some clay masks. Clay masks can help clear pores of surface buildup, purify your skin, control the production of sebum, help with blackheads and whiteheads and tighten your pores. There are different types of clay like kaolin, bentonite, green, red and French; each address different skin concerns. However, a clay mask, in general, will act as a magnet and draw out dirt, impurities, oil and build-up in your pores. Clay masks have a plethora of benefits of those with acne-prone skin too, so give it a shot. While a clay mask is always a solid choice for skin that leans on oily, it could be too much for the drier areas of your face. So don’t be afraid to multi-mask. Use a strong mask on oilier areas like your T-zone and use a gentle mask on drier areas. These are some of my tried, tested and approved clay masks that worked magic on my sensitive, combination, acne-prone skin! The Origins mask is formulated with activated charcoal and white china clay to purify skin, unclog pores, absorb toxins and give your skin some life. This is gentle enough to be used twice a week and by the way, charcoal masks are AMAZING for those with acne prone skin and blackheads. The is my go-to mask, I love it. It also helps lighten acne scars, dry up active acne, clean out blackheads and reduce inflammation. This is great to clear stubborn cystic acne, blemishes and inflammation too. The best way to use this mask is with organic apple cider vinegar. Check out my story on how this mask transformed my skin here. Enriched with charcoal, clay, essential oils and AHA and BHA’s the mask attracts toxins up to 500 times its volume. That’s one jar with big claims, and I promise you it’s worth the splurge. Watch your skin clear up in just a few uses. With regular use, it will get rid of enlarged pores, acne, blemishes and oiliness. The Innisfree volcanic clay mask absorbs sebum and gives your pores an intensive deep clean. The clay is pure volcanic clay from the Jeju islands and considered to be one of the most effective. The mask exfoliates and removes dead skin cells and contracts pores. This mask harnesses the power of French Green Clay which is nature’s strongest magnet for toxins, impurities, and oils. It is infused with essential oils to tighten skin, stimulate blood flow and make your skin soft and clear. You can use it on your entire body too! L’Oréal Paris’ pure exfoliating clay mask is enriched with Red Algae Extracts. It also has apricot seed extracts to exfoliate and refine your skin in just 10 minutes. Dull, rough skin and clogged pores stand no chance! Your skin will feel polished, bright, smooth and soft post-application. Your pores will be visibly minimised and your skin will glow. 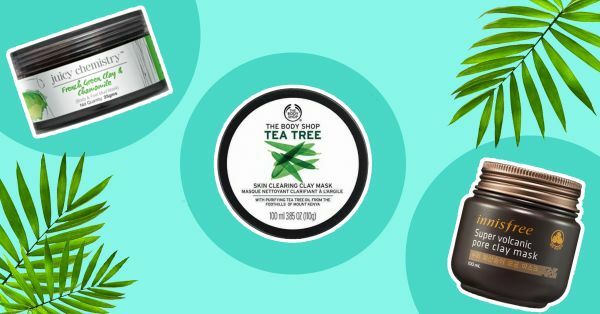 It’s no secret that tea tree is a boon for people with oily and acne-prone skin. This creamy mask from The Body Shop is gentle and effective when it comes to cleansing, purifying and soothing your skin. The presence of tea-tree leaves a mild, cooling feeling on your skin. A relatively new entrant to the mask-mania, the DearPacker The Madagascar Clay Mask gives you the best of K-beauty customised for Indian skin. The mask is enriched with Madagascar clay extract and Asian Centella Romantica. It deep cleanses your pores and smoothens your skin. It also helps curb those annoying black and whiteheads. If you haven’t ever tried a clay mask, your skin is yearning for it. Go ahead and indulge, you won’t find the need to go to the salon for a clean-up - promise!